The heated pool spa and salon services and beach location near San Diego's Gaslamp Quarter tick all the right boxes at the non-smoking Hotel del Coronado Curio Collection by Hilton. Built in 1888 the seven-story Victorian-style Hotel del Coronado furnishes 679 rooms with patios or balconies premium bedding and seaside touches plus mini-fridges coffeemakers 42-inch flat-panel HDTVs and upscale toiletries. In addition to multiple dining options this hotel adds outdoor fun to its menu including fire pits and a heated year-round pool. Pamper yourself with spa services or with a new 'do in the salon. Guests can also enjoy leisure and business perks from fitness and work facilities to bike rentals and meeting options. Pets are allowed for a fee. 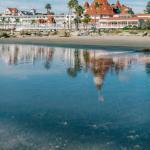 Situated on the California Pacific coastline the Hotel del Coronado offers a San Diego setting adjacent to Coronado Beach. Head five miles north for Gaslamp Quarter excitement. The hotel is also within 20 minutes of the San Diego Zoo and 14 miles from SeaWorld and Belmont Park. San Diego International Airport is within nine miles north of the hotel.